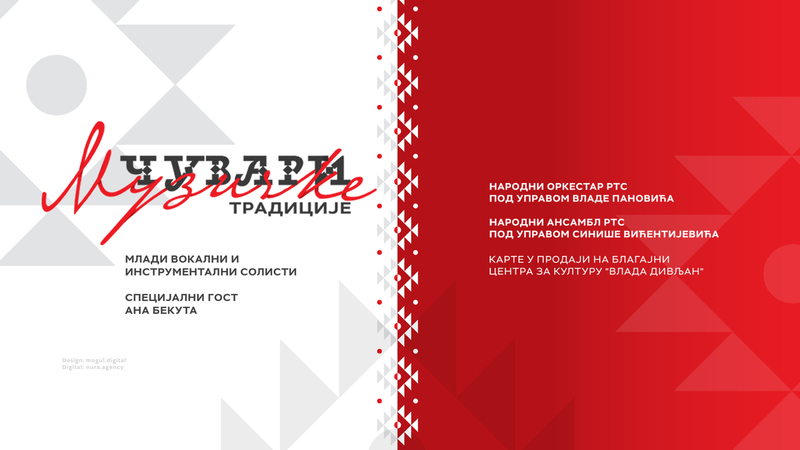 Young vocal and instrumental soloists, who with their performance qualities and sense of fostering traditional songs, as well as selected compositions in the folk spirit deserve to be presented to the concert audience, as artists who will successfully continue the practice cherished for decades in Radio Television of Serbia, are performing at the Cultural Center “Vlada Divljan” in Belgrade, on Wednesday, 20 February. Twelve young vocal and instrumental soloists: Biljana Petkovic, Branimir Stosic, Vesna Dimic, Nada Jovanovic, Danilo Zivkovc, Dragi Domic, Milena Jovanovic, Aleksandar Tirnanic, Neda Nikolic-frula, Renato Henc, Larisa Kopic-violin and Nemanja Kujundzic will perform accompanied by the RTS Folk Orchestra conducted by Vlada Popovic and The RTS Folk Ensemble conducted by Sinisa Vicentijevic. A special guest at the concert “Keepers of musical tradition” will be an outstanding artist and vocal soloist, Ana Bekuta, who is recording permanent recordings for the RTS Sound archive for several years and participates in numerous programs and concerts of the national broadcasting service of Serbia. For this concert you can buy tickets at the box office of the Cultural Center “Vlada Divljan”.